Powerful drives, high power density and easy integration — these keywords best describe this year's presence at the world's largest technology trade show in Hanover from April 1st – 5th. maxon motor will present new solutions that will benefit customers all over the world. Together with its long-term partner Servo Dynamics, drive specialist maxon motor has founded a new sales company for the South East Asia region – a move that also takes into account the changed global economic situation. The maxon motor group is adding another valuable new member: maxon acquired the British geared motor manufacturer Parvalux Electric Motors Ltd. The acquisition expands the maxon portfolio with powerful drives for applications in medical technology and industrial automation, among other fields. With the EPOS4 series, maxon is offering a reliable and extremely versatile platform of high-performance motion controllers. It addresses the needs of system integrators and fulfills the requirements of a variety of applications, such as industrial automation, apparatus engineering, and robotics. The platform is now being complemented with two new Compact EtherCAT models. Now Available: the latest issue of maxon’s driven magazine. In passenger aircrafts, small electric motors are taking over many tasks that used to be performed mechanically or hydraulically. This is a rapidly growing trend. Welcome on board! maxon is a part of NASA's InSight mission. In just a few days, the InSight probe will land on Mars to shed new light on the formation of rocky planets. The mission entails driving a measuring probe five meters deep into the Martian ground. maxon engineers pulled out all the stops to make their motor fit for the job. The drive specialist is focusing its competences. NASA is again working with maxon motor. Two years from now, the US space agency NASA will send a new rover to the Red Planet. Included: a small helicopter, which will take the first aerial photos of Mars. The rotors will be controlled by robust DC motors from Switzerland. maxon’s brushless EC 90 flat motor with 1 Nm. maxon's new brushless EC 90 flat motor features maximum torque in a compact design. This and all other drives in this series of motors are now also available with cables. maxon’s driven magazine takes a look at bionics. Engineers from all over the world are getting inspiration from nature and are developing technologies at the highest level, from bionic prostheses, to exoskeletons for children, and even a salamander with a spine. maxon presents the EPOS4 70/15 controller. The drive specialists at maxon motor have developed the EPOS4 70/15 positioning controller, the most powerful model in its series with a maximum output of 2.1 kW. maxon motor launches its most powerful positon controller, the EPOS4 70/15. 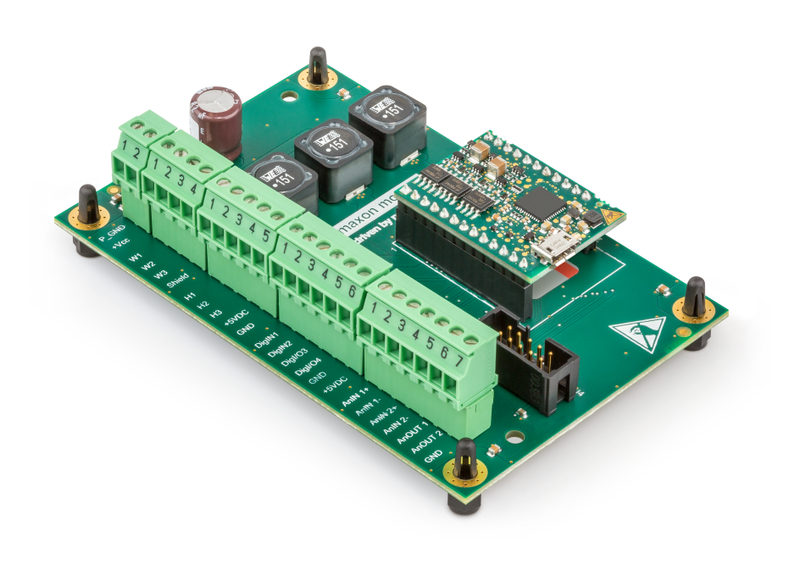 The CANopen controller with an EtherCAT option comes in a robust metal housing. It delivers up to 2.1 kW of output power and is suitable for controlling both brushed and brushless DC motors. ENX 16 RIO encoder from maxon motor. maxon motor presents a top-of-the-range high-resolution encoder. The ENX 16 RIO offers an impressive resolution of up to 65,536 counts per turn in a compact and rugged housing. Upon the death of Bodo Fütterer:On February 1, 2018, the maxon motor group's longtime CEO and chairman of the board of directors passed away at the age of 91. The story of the maxon motor group could not have been written without Bodo Fütterer. He was one of the key figures who made the company a global market leader in the development and production of high-quality drive components and systems. maxon now offers BLDC motors as frameless kits. Motors used in robotics must be lightweight while simultaneously providing high torque in order for arms and grippers to move dynamically. This is why Swiss drive specialist maxon motor is offering a new solution: The tried and tested brushless flat motors as frameless kits. This gives rise to a number of benefits. With their optimized magnetic circuit and special rotor, the new brushless DC motors from maxon deliver an impressive amount of torque. The EC-i 52 drives are considered to be high quality at an attractive price. NASA's next Mars rover will collect soil samples, seal them and deposit them on the Martian surface for future collection and transport back to Earth. Swiss manufacturer maxon motor supplies several drives specifically developed for the task. A rugged, compact powerhouse: The new ESCON Module 50/8 HE servo controller from maxon motor controls DC motors of up to 750 W, even in the harshest ambient conditions. The Swiss drive specialist maxon motor is expanding its range of servo controllers by adding the ESCON Module 50/8 HE (Harsh Environment). This compact plug-in module with a nominal current of 8 A is a true powerhouse, designed for brushed and brushless DC motors with a peak power of up to 750 W.
With the ENX EASY, maxon motor is offering a sterilizable encoder for its brushless DC motors for the first time. This opens up a range of new possibilities in medical technology – and it's not the only innovation coming from the Swiss drive specialist. driven magazine reveals where they are used. Precision drive systems can be found in the home, in vehicles, and at work, making our lives simpler and safer. The current issue of driven, the maxon motor magazine, provides interesting insights into the world of drive technology. It also goes in search of an old friend. Company to invest CHF 30 million at its headquarters Swiss drive specialist maxon motor is expanding its headquarters in Switzerland. Construction of the new Innovation Center is due to start in February. The building is scheduled to be ready for use by summer 2018. At this location, the company will also develop and manufacture its smallest drives. The Swiss Museum of Transport opens a new space exhibition to the public. Visitors learn about the past and the future of space travel and walk through the landscape of our neighbor planet Mars. maxon motor introduces additional brushless DC motors in its ECX series. They are fast, powerful, and easily configured on a computer. These motors are complemented with new modules for the compact EPOS4 positioning controller, which has a high power density and easy handling. Drive technology is becoming even better and more intuitive. In medical technology, there are thousands of patent applications every year. New robots, measuring devices, and other tools minimize the risks of surgery. Some of the latest technologies are presented in driven, the maxon motor magazine. Never before has it been this simple to put together a customized, high-end drive, at work or at home, using maxon motor's online configurator. A variety of brushless, high-speed motors and gearheads are now available. At the first Cybathlon in Zürich, researchers are presenting the world's best exoskeletons – devices that enable paraplegics to walk again. Motors from Switzerland play a central part in this development. On October 8th, people with paraplegia are going on a footrace at the Cybathlon in Zürich. Aided by exoskeletons, they will compete against each other on an obstacle course to show the public how far advanced technology has come in this area. The drive specialist maxon motor has created the Young Engineers Program to work more closely with schools and start-ups. 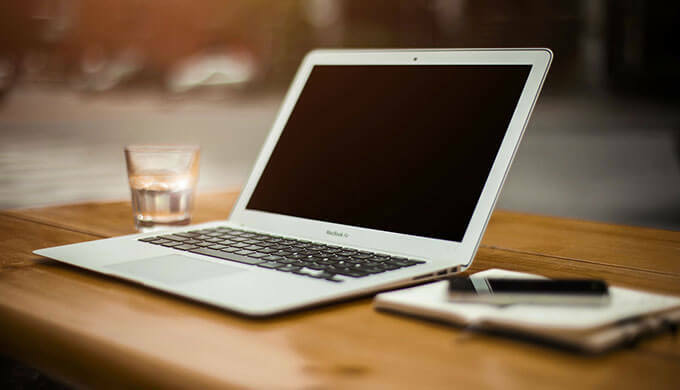 Their innovative projects benefit from discounted drives and expert consulting. A treat is in store for drive technology aficionados: drive.tech, a brand-new website with interesting stories, news, and blog posts. In addition, drive.tech is a platform for start-ups and student projects supported by Swiss drive specialist maxon motor. Faster and faster – with maxon. Robots for home and work. The latest issue of maxon's driven magazine explores the challenges in robotic applications. The new issue of driven, the maxon motor magazine is now available. In this issue, we learn that interaction between humans and robots will become much closer in the years to come, both at home and at work. What will this new interaction look like? What are the technical challenges? This latest issue of driven provides some of these answers and more. Robots are now able to perform increasingly complex tasks both at home and at work. Read about Pepper, the little communication robot that can detect our moods and respond accordingly. The increasing amout of small industrial robots working hand-in-hand with humans and how awareness of their environment helps them to avoid collisions. You will also learn more about how to control axes in robotics, and which DC motors and controllers are suitable for a given application. The new issue of driven also provides some insights into the ethical issues surrounding the use of robotics. Read about these topics and much more in the latest issue. The maxon GP 6 S spindle gear The GP 6 S micro spindle gear has a diameter of six millimeters and is now also available in a metal version to provide a spindle drive with optimized value. Spindle drives are the perfect solution for linear positioning systems, lens adjustment, or syringe pumps. If the drive also has to be compact, then maxon motor’s GP 6 S spindle gear is the perfect choice. To provide a cost-effective alternative to the ceramic version, it is now also available with a metal spindle. A sterilizable EC-4pole 30 from maxon motor maxon’s new brushless electric motor, the EC-4pole 30, delivers high torque (106 mNm) and is sterilizable – a perfect drive for hand-held surgical tools. Swiss drive specialist maxon motor has developed a robust brushless DC motor for hand-held surgical tools: the EC-4pole 30. Featuring two pole pairs, this DC motor provides a nominal torque of 106 mNm and an output of 150 W. It has a hermetically sealed rotor, meaning that it can withstand over 1000 autoclave cycles. maxon sets new standards in micro drives. maxon's smallest DC brushless motor is only four millimeters in diameter and comes in two different lengths. Certified in accordance with ISO 13485, the new brushless micro drive is ideal for medical applications. The EC 4 brushless DC motor is maxon motor's ultra-compact solution to the market's needs. As the smallest micromotor to come from the Swiss manufacturer, the EC 4 is only four millimeters in diameter. It is available in two lengths, with power ratings of 0.5 and 1 W. Equipped with an ironless maxon winding, the EC 4 stands out for its robust design, high power density, and energy efficiency. For applications demanding very high torque, drive specialist maxonmotor is now launching its EC-i 40 DC brushless motor in a High Torque version. The iron-coreinternal rotor drive is available with a diameter of 40 mm and delivers up to 234 mNm of torque. When it comes to powerful movements, maxon delivers with itsEC-i 40 High Torque series of DC motors. The Swiss drive specialist presents three powerful iron-coreinternal rotor drives.The drives have a diameter of 40 mm and are equipped with an innovative rotor. They featurehigh dynamics, a low cogging torque, and extremely high output torque. The strongest motor in this series offers a maximum nominal torque of 234 mNm and is56 millimeters inlength. It exceeds the performance of its precursor model by up to 70 percent. EPOS2 Positioning Controllers support additional Platforms. The successful maxon motor EPOS2 motion controllers for DC and BLDC motors are being enriched by even more possible fields of applications. Mini from outside – maxi from within. As addition to the successful ESCON servo controller family, maxon motor presents another miniaturized, postage stamp-sized OEM plug-in module. The high-performance 4-quadrant PWM servo motor controller is designed to command permanent-magnet-activated brushed DC motors and BLDC motors (brushless DC motors, so-called EC motors) with Hall sensors up to 48 Watt continuous output and 144 Watt peak output. As part of the ESCON family it stands for high usability, exceptional performance, and unprecedented power density in servo motor controller technology. More comfort, functionality, protection, and performance can hardly be attained. High-tech for health and beauty The new issue of driven – the maxon motor magazine – is now available. In this issue, we peek over the shoulder of a surgeon using the da Vinci surgical robot, present a new device for cardiac patients and take a look at the world's first cordless tattoo machine. maxon motor expands its global network. New sales company in France. maxon motor, leading worldwide supplier of high-precision micromotors, is increasing its presence in France. Effective from October 1, 2014, the Swiss drive specialist is integrating its long-time sales partner mdp sas into the corporate group. The employees will remain with the company. maxon motor, the provider of DC motors and drive systems, is constantly expanding its global network in order to be able to react to the needs of its customers faster and more flexibly. The Swiss company currently has more than 2000 employees at four production sites and in 14 sales companies worldwide.Now maxon motor is strengthening its activity in France as well. On October 1, 2014, the drive specialist will take over the motor business of long-time sales partner mdp sas. Under the same name, mdp will in future operate as the new maxon sales company in France. 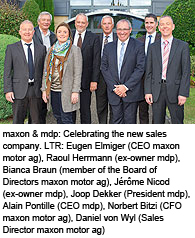 The current employees will remain with the company as well as the long-time and experienced Managing Director, Alain Pontille.This step will bring maxon motor even closer to its customers in France and help the company provide its French customers with expert consultation tailored to their specific needs. The customers profit from the same product range as before and from the vast experience of the maxon engineers in the fields of industrial automation, robotics and medical technology. Many of the French companies that are global leaders in these fields already count on maxon products. After more than ten years of travel through space, the European space probe Rosetta has reached the comet Chury. Three months from now, for the first time in the history of space travel, a lander will touch down on the surface of the four-kilometer-wide comet. DC motors manufactured by maxon are part of this pioneering feat. maxon - eine starke globale Marke. Die Firma maxon motor mit Hauptsitz in Sachseln/Zentralschweiz verfügt nebst Produktions-standorten in der Schweiz, in Deutschland, Ungarn, Korea, Frankreich und den Niederlanden über Vertriebsgesellschaften in mehr als 30 Ländern. Wir produzieren alle wichtigen Kompo-nenten unserer Antriebssysteme auf weitgehend selbst entwickelten Maschinen und Produk-tionsstrassen. Dies garantiert neben einer rationellen Fertigung von grossen Serien auch höchstmögliche Flexibilität bei speziellen Anforderungen oder kleineren Stückzahlen.